Along with people worldwide, Eastern Europeans welcome in the New Year with revelry and special foods thought to bring good luck, health, and prosperity. Fish, especially those with silver scales, are thought to symbolize money. Pickled herring are a must for Poles at the stroke of midnight on New Year's Eve. Greens, usually cabbage, are associated with money and, thus, thought to bring good fortune. Eating cabbage probably worked its way into New Year lore because it is a late-fall crop and the best way to preserve it for the winter was by turning it into sauerkraut. Brining cabbage typically takes six to eight weeks, and would be perfect to eat around New Year. Sauerkraut's long strands also symbolize long life. Legumes, lentils, and peas also symbolize money as their appearance resembles coins that swell when cooked. Poppy seeds are considered a lucky food in Poland, so you will find them throughout the cuisine and especially on Christmas Eve and New Year's Eve. Pork's rich fat content symbolizes wealth and prosperity. Pork is also considered a symbol of progress because pigs root forward. Spit-roasted pig is common, as is roast pork loin, sausages and more. The tradition of eating pork probably has more to do with slaughter times than ensuring good fortune. Ring-shaped foods like cookies, doughnuts, and bagels symbolize the year coming full circle and represents eternity. Lobster and crab are considered bad luck because they move backward and could lead to setbacks. Chicken is also a no-no because they scratch backward, and eating any winged fowl is disadvised because this could portend one's good luck flying away. In Bulgaria, New Year celebrations are week-long affairs featuring processions, musical festivals, carnivals, and sporting events. New Year's Eve is spent visiting friends, making merry, eating lucky foods and making toasts with rakia (grape brandy) and other potent potables. New Year's Day is St. Basil's feast day or vassilyovden when the health-wishing custom of survaki (also known as sourvakari) is observed. Twigs or small branches of the cornel (dogwood) tree, called survaknitsa (also known as sourvachka), are decorated with brightly colored papers. Children brandish their parents, grandparents, aunts, and uncles with these twigs, wishing them well for the new year. In return, the children are rewarded with nuts, candies, and coins. Alternatively, the men of the village go from house to house to do the blessing. New Year is also celebrated by wearing new clothes -- out with the old and in with the new. New Year's Day dinner is a lavish affair, as the richer the spread, the more fruitful the coming year will be. A ritual bread is decorated with religious symbols or vines and hives made of bread dough, and a special place is saved for a cheese banitza (also spelled banitsa) with baked-in cornel (dogwood) buds symbolizing home, family and livestock, and promising good health for the coming year. In western Bulgaria, the central Balkans and in some regions along the Danube River, the custom of ladouvane (also known as koumichene) is observed on New Year's Eve by women wishing to get married. In the rest of the country, it is celebrated on Midsummer Day. The maidens of the village drop symbols of fertility -- rings tied with red string to a spray of fresh ivy or basil, oats and barley -- into a kettle full of spring water on Dec. 30. The kettle is left overnight in the open, under the stars and, on New Year's Eve, following a ritual dance around it, the girls' fortunes are told. For Orthodox Christian Bulgarians, who follow the Julian calendar, New Year's Eve and Day are celebrated Jan. 13-14. In Croatia, New Year's Eve is celebrated with parties in houses, hotels, discos and public squares. Fireworks on the stroke of midnight is common in the larger cities of Dubrovnik, Hvar, and Split. Lucky foods eaten include sarma, spit-roasted pig (pecenka), and fish and seafood for those living along the Dalmatian coast. Cevapcici, ajvar, burek, coldcut trays, strudels, nut rolls, and so much more are also eaten on New Year's Day, according to the family's preferences. As in Poland, New Year's Eve is known as St. Sylvester's Day because it is the saint's feast day. And, since Prague was his place of birth, the tie is even stronger in The Czech Republic. New Year's Eve is party time with various chlebíčky (open-faced sandwiches), nuts, brambůrky (homemade potato chips) and other snacks. Midnight is celebrated by drinking šampaňské (champagne) or some other local sparkling wine. Some Czechs eat vepřový ovar (boiled pork head) with se strouhaným křenem a jablky (grated horseradish and apples) at midnight. On New Year's Day, cočka (lentils), a symbol of money, are eaten along with pork and leftover vánoční cukrový. After being carried around the village, effigies of Jack Straw, a scapegoat representing the evils and misfortunes of the past year, are burned on Szilveszter or New Year's Eve. In big cities, there are public celebrations and parties where young and old dance away the night. There is also a New Year's ball and concert at the Hungarian State Opera House in Budapest. Street vendors sell masks and noisemakers for the children. On New Year's Day, roast suckling pig and lencse fõzelék (lentil soup) are served -- both considered lucky foods. While other cultures eat fish because the silver scales are reminiscent of money, eating fish in Hungary is considered unlucky because they will swim away with one's good fortune. In some regions of Lithuania, New Year's Eve is known as "little Christmas Eve," and foods similar to those served for Christmas Eve are eaten, except the dishes contain meat. People stay up until midnight because sleeping through the beginning of the new year will bring bad luck. An important part of New Year's Eve and Day is the telling of fortunes and making predictions. 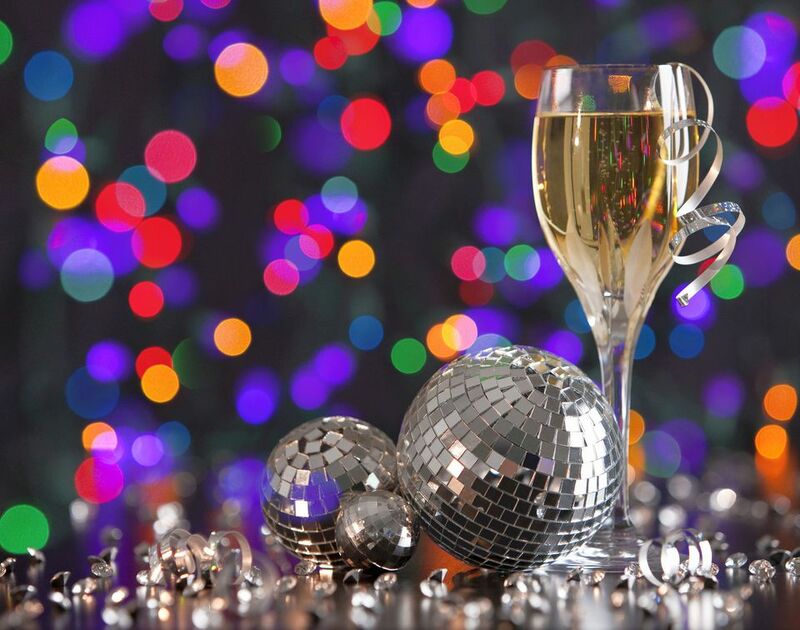 New Year's Eve is known as Sylwester because it falls on the feast day of St. Sylvester. Poles party hearty with good food and drink. New Year’s Day festivities might include a hayride into the forest where a bonfire is set and sausages, bigos and wodka are enjoyed. Bakers sell breads and rolls in the shape of rabbits, sheep, geese, and cows to assure wealth and good luck for the coming year. Round or ring-shaped breads are also popular because they symbolize life coming full circle and eternity, and pączki are served for dessert. Sylwester begins Carnival -- a period of balls and parties before Lent begins. In Romania, lucky foods include sarmale (cabbage rolls) and mititei (a free-formed sausage). The New Year dinner is lavish because it is believed if the meal is rich, so will be the new year. Palinca (plum brandy) is a traditional beverage. Fortune telling is an important part of Romanian New Year customs. Russian Orthodox Christians who follow the Julian calendar celebrate New Year's Eve and Day Jan. 13-14. But for those who abide by the government's New Year based on the Gregorian calendar, it is celebrated Dec. 31-Jan. 1. Public celebrations, fireworks, drinking vodka and champagne, partying in clubs or in private homes with an abundance of zakuski or "little bites" (appetizers) is traditional. On New Year's Day, a sumptuous meal of roast duck, caviar, salad olivier, fish in aspic, mushrooms in cream, nut cookies, New Year Clock Cake, and sbiten, a hot, non-alcoholic or alcoholic spiced drink, are consumed. Most Serbians are Orthodox Christians who celebrate New Year's Eve and Day on Jan. 13-14, according to the Julian calendar. There is an abundance of food and drink, including sarma, spit-roasted pig, tortes, nut rolls, strudels, and desserts galore. Rakija, a powerful drink of grape brandy, sometimes blended with whiskey and spices, is traditional at this time of year. Christmas trees are decorated and presents given on New Year's Day rather than Christmas Day. At midnight on New Year's Eve, Deda Mraz (Grandpa Frost) visits houses and leaves presents under the tree. Outdoor parties with live bands are typical in the larger cities. Feasting is on pork and many rich desserts like Prekmurska Gibanica or potica on New Year's Day. Feasting on fish, pork, legumes, holubtsi (cabbage rolls), pampushki (stuffed and fried potato ball), cakes and other confections is a big part of Ukrainian New Year's Eve and Day festivities. Ukrainians, who follow the Julian calendar, celebrate on Jan. 13-14 (although, as in Russia, the national New Year is technically Jan. 1). Families gather to reflect on the past year, make toasts and predictions about the coming year, and presents are exchanged. Grandfather Frost and his granddaughter, the Snow Maiden, pay a visit.